One of the things I love about the A&I Agile Release Train is their drive to learn. Following the Re-Squadification day the train held a focused retrospective in order to understand what had gone wrong and how they could avoid a reoccurrence of a long drawn out self-selection process in the future. The insights were fascinating. There were three main drivers of the stalemate - a belief the teams of 6 or 7 would not be effective, “feature pitching” by Scrum Masters and Product Owners and people trying to do the right thing! The frustration with team size I put down to a combination of decisions being made behind closed doors and lack of communication. Deciding the team numbers was perceived as a logical decision that didn’t require wide consultation. In hindsight I am embarrassed I didn’t think to suggest to the RTEs that they take the suggestion to the train before communicating it. Or even better involve the train in making the decision in the first place. It was naive of us to assume the teams would not have strong opinions regarding team size. I wonder if subconsciously we feared retaliation, as despite being three PIs in there were still fierce debate across the train regarding the need for component teams. In reality we just didn’t have holistic buy in to the feature team model. The “feature pitching” was frustrating. Based on the learnings from the first self-selection event we had tried to remove the “work” from the decision but we probably had not been explicit enough in that respect. Teams were recruiting members based on the features they intended to pull. Again, I fear communication had been our downfall. The third cause was more interesting and somewhat unexpected. In line with +Sandy and Dave’s guidance we briefed the train to consider the best interests of the company and the train in making the team selections. As the day went on, we came back to that message time and time again but it didn’t seem to make any difference. When the leadership dug into this post the event, we learnt that team members were staying put because they believed that their membership of a specific team was in the best interests of the company! I also felt that “absentee voters” had been a challenge. In almost every case the person who was not present had given a specific instruction about what squad they wanted to be in and their proxy did not feel empowered to move them. The opportunity to use these learning came around sooner rather than later, as the addition of some new delivery partners meant more teams on the train in PI5. Feedback from the last self-selection event indicated that the train valued the ability to do self-selection, however, they were not in a hurry to do it again! Wanting to empower the train, the leadership put it to a vote: Should the train self-select prior to PI5 or should the leadership team make the required changes and inform the teams of the outcome? The result: self-selection with a tie-breaker process was the most popular option. In discussing this outcome with some of the leadership teams, another lesson emerged for me. We were talking about possible tie-breaker approaches. I was reiterating my position about avoiding management intervention when one of the managers pointed out to me that is the role of leadership to support the people who do the work (as I am so fond of saying!) and therefore if the teams can’t work out how best to organise it is incumbent on leadership to help them. When it is put like that I have to say I agree. We went on to talk about what form that intervention should take, as I still felt the approach was not quite right the first time. He then went on to share with me the actions the teams had agreed following the re-squadification retrospective. Chapter Leads would brief their teams prior to the event and provide guidance on the competency mix expected. SMs & POs should not use the features that want to work on as a way of encouraging people to join their squad. (Feature decisions should be made by the whole squad once it is formed). There should be a tie-breaker process if a stalemate occurs. The suggestion being that chapter leads for the unbalanced competencies would provide some real time coaching in the event of a stalemate. This time A&I would run the event themselves, which was another excellent outcome, even if I do have to admit I was suffering a little bit of FOMO. When it comes to the results, with permission, I would like to share with you the email I received post the event. Thought you would be interested in hearing about how self-selection went yesterday. I shared a pack the day prior to S-S that included your suggested things that team members should consider when selecting squads. This pack also included a details of the squad construct we were looking for. Chapter leads also spoke to their respective teams prior to S-S. I briefed POs and SMs to be very clear that they should talk about themselves, their style/approach and generally how they go about it. I also gave very clear steer not to talk about features. I shared overview of process – I highlighted that the retro we did following the last S-S had defined a “tie-breaker” process if we reach a stalemate on balancing the train, but also highlighted that we really wanted to only use this as a last resort and expressed my confidence that the Train should be able to solve it. We will pull together the retro feedback, but a couple of themes that I observed that I think really helped. Room set up – this was more by luck rather than by design. 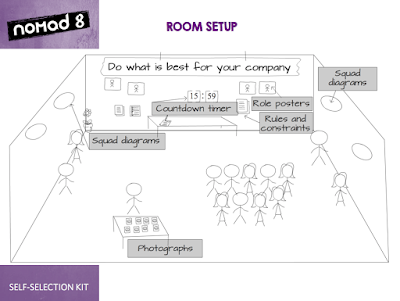 We had a relatively small room, so I facilitated “in the round” – there were no tables or chairs, just flipcharts dotted around the outside of the room. I think this really helped with the energy and dynamic in the room and forced people to stand by the squad that they had chosen in each round. This really made facilitation relatively easy. Thanks a lot for your guidance – I think that whilst we have probably invested significantly more time up-front in planning the event this time around, we have landed in a better spot. Get the book from Amazon now! There is no such thing a Feature Owner... Or is there? What Happens to Project Managers When You Implement SAFe?